I have enjoyed the info I've read so far on the links on Brooks and People of the Book. The interview was especially appreciated as it was good to see/hear the author. It sounds like it is going to be a good read. The March/April 2008 issue of Bookmarks Magazine also has an article on Geraldine Brooks. I have been sick with a cold-flu-like thing for the past week or so and am just now beginning to feel better (although still very tired a lot and without energy). I just got done reading all the posts and wanted to say I plan on finishing reading the third part of ILE as soon as I get done reading March for RGG and I'll comment on it once I'm done. After reading Bonnie's posts and checking out a copy in Costco today (they have three stacks left and it's $14), I really want to read POB with ya'll this month. I am going to get a library card at the county library by my parents and see if I can get the book from there on Friday before I buy it though. In regards to posting comments/etc., I know for me because this is a blog and not a forum/bulletin board, I feel compelled to post when I'm thinking clearly and watch my spelling/grammar more rather than posting off the cuff. I'm not really sure why this is and I know it's misguided. I mean to be mindful and make more of an effort to just post when I have something to say. Also, I have have to say ILE was just an odd discussion book to me (from what I've read so far) and I didn't particularly hate the book either. Anyways, just wanted to check in and say hi and... ramble. I tend to ramble/type as I think in forums/boards and that seems somehow wrong in a blog too. I mean I know I can get wordy and run on lengthly. My high school English prof told me so. lol. I believe she used the words pompous and witty to describe my writing style as well though. Tricia said, "I heard Brooks speak about this book on New Year's day. You can hear it here. I finally have my head above water at work and am looking forward to reading this with you." Bonnie: Thanks, Tricia. I've put the NPR link in this post so more of our book buddies will notice it. And here's a short piece about Brooks, written by Maureen Pao for Novel Ideas. Oh yeah, Bonnie. I had the same reaction when they mentioned Geppo again. Geppo? Then, I remembered Geppo. The trouble with this book was there was many ramblings of thoughts & ideas. It was almost half diary & half novel. Maybe that was the effect that the author wanted. It was as if the author wanted to cram so many ideas & thoughts in 1 book, that it was a little disjointed. Talking about the salty tears that fell into the food from the mother, after her loss of her boy & husband, & then Lucia saying that the food tasted salty, made me want to barf. I said to myself, ohhhh Grosssss!!!! Yech!!!!!!!! Geppo's story? Why was it even put into the book? It had nothing to do with the plot. If so, please correct me. ILI's musings - I for one am glad that Lucia finally faced G., even if she didn't tell the total truth to him. Now that he said that she looked repulsive & obviously wanted no part of her, Lucia could finally make peace with her past & have a resolution of that relationship. In other words, purge him out of her life, once & for all. In the end, she found another man that loved her just as she was & swept her away to America. Ha!! Take that G!!! Oh well, I shouldn't judge him, but as she had said, he didn't even care what had .happened to her throughout the years. How does anyone else feel? I can't be the only one besides Bonnie that read this book? Speak up people!! 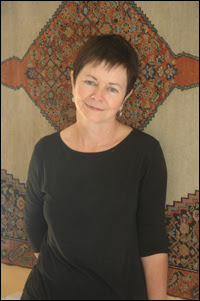 Click above to view a 3-minute interview with Geraldine Brooks on the facts behind the book. 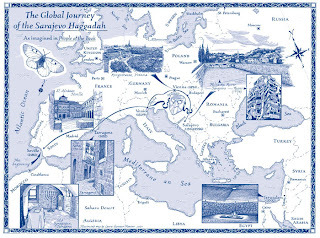 And be aware as you read The People of the Book that the Sarajevo Haggadah is presently owned by the National Museum of Bosnia and Herzegovina in Sarajevo, where it is on permanent display. 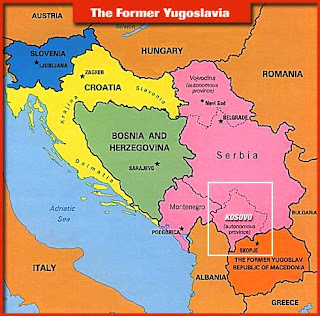 Do you realize that Bosnia (whose capital is Sarajevo) and Kosovo (which proclaimed independence from Serbia last week) are both parts of the former Yugoslavia? Take a good look at this map of the area, where the religions of "the people of the book" (Judaism, Christianity, and Islam) are jumbled together in often unhappy juxtaposition. 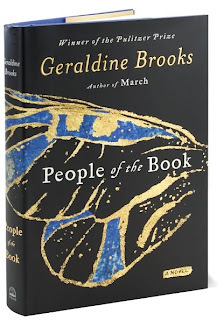 People of the Book by Geraldine Brooks is divided into thirteen sections. I'll add names here, as they are introduced in the book, and (in an attempt to make it worth your while to come here and comment) I'll add "notes, quotes, and questions" about POB in a separate post: click here. 9. Toby said, "I haven't finished the book yet, but I had been wondering if when I was younger, if I had hid my face from my old boyfriend, would he had realized it was me? Wouldn't he had recognized my voice? That is what I would ask Lucia & G." Good question. Bonnie wondered, "Wouldn't Giacomo have recognized the voice of his very recent lover when Lucia appeared as a decrepit old woman?" Although Lucia confides what she did, I'm not sure this would be enough to fool him. What do you think? "I am as happy to see you prosperous," I said in Italian, attempting the higher, softer voice of my youth, "as you must be disturbed at seeing what has become of me." 10. How did Lucia's feelings toward her parents change, and why? 12. Lucia states, "At last, I had stopped imagining myself in the gaze of others. . . . And so the mask I had put on to distance myself actually brought me closer to other people" (p. 198). How does wearing a veil bring Lucia closer to others? How does Lucia’s veil affect others’ perception of her? Does it affect how she perceives herself? 13. Of Amsterdam society Lucia says, "Tolerance is not the equal of acceptance. Indeed, the two are more nearly opposites, the former sometimes serving as a subtle means of repression" (p. 163). In the book, appearances and looks are very focal to the urban societies of eighteenth-century Europe. Is Western society in the twenty-first century any different than Amsterdam with respect to its treatment of scarred or unsightly people? How might contemporary Western society respond to a veiled woman? 14. Lucia says, "I too tried to carry the yoke of reason, but it was too heavy for me. I rejected it" (pp. 230—231). From Lucia’s point of view, the Age of Enlightenment resulted in confusion rather than progress. How does Casanova reflect this confusion? Can Lucia reject the confusion of her age entirely, or has she been shaped by it herself? Has Lucia’s education, her exposure to scholarship and reason in the house of the Morandi Manzolinis (pp. 103–108), benefited her in any way that she is not acknowledging? How might Lucia have fared differently if she had been schooled in religion and faith and never exposed to science and knowledge? 15. How are Lucia’s emotional and physical relations with the adult Casanova different from her relations with other men? What has Giacomo Casanova learned as a seducer of women? Is he more artful than Lucia when it comes to seduction? How does viewing Casanova through Lucia’s eyes alter the reader’s preconceptions of Casanova? 16. After her illness, Lucia deduces that she must abandon Casanova because staying with him would have "produced two unhappy people," whereas leaving him would have produced "only one" (p. 97). After meeting de Seingalt years later, she recalculates with hindsight: "Would the tender Giacomo of Pasiano have ever changed into the cynical Jacques de Seingalt if I had listened to my girlish heart and not subdued my fierce desire with clear-eyed foresight? What if I had dared to show him myself ravaged, trusting to our love, letting life and nature run their course instead of sacrificing myself like some inane operatic heroine? In that case, I alone would have been disfigured; now we both were" (p. 158). With the benefit of hindsight, might Lucia have trusted to their love if she had the chance to do it again? Should she have? How might Lucia’s life have turned out differently if Casanova had rejected her? Is Casanova in fact "disfigured" by Lucia’s youthful rejection of him? 17. Casanova states the lesson of his own life: "It is unpardonable sin not to take what love puts before you" (p. 223). What does Lucia think of this "lesson"? Why does Lucia not view this as her own life’s lesson? 18. After their wager is over, and Galathée removes her veil to become Lucia again for Casanova, she says of her appearance "at that moment it wasn’t a source of shame. ... Suddenly I saw, like some saintly vision, the lesson Fate had been trying to teach me" (p. 217). What did Lucia learn in that moment? Did this revelation make her suffering worthwhile in her view? 19. What in Seingalt’s final letter to Lucia makes her change her mind and leave with Jamieson? 1. How do Lucia’s early relationships shape the person she becomes? What does the Countess of Montereale give Lucia that her own mother cannot? 2. Lucia claims to have faith in self-delusion. She says, "Self-delusion has the benefit of letting us believe that everything is still possible. I have a talent for that" (p. 14). She also says, "Truth is more than the things you see; that is why its value is only relative. I am very careful with it" (p. 16). And she goes so far as to say, "The only thing that can change reality is the mind. ... If one would change things, one needn’t touch them; one need only see them differently" (p. 46). In what ways does Lucia delude herself? When does she choose the truth over self-delusion? 3. Lucia says of men, "Most aim to please with little understanding of our pleasure. ... More than anything, men want that which has been withheld. A happy certainty is no match for a mystery denied. Given a choice, a man will always take the unknown" (pp. 8–10). What is Lucia’s opinion about men? 5. At what point does Lucia realize that the Chevalier de Seingalt is Casanova? What does he do or say that causes her to realize that the adult Casanova is a different person than the young man whom she loved and who loved her? Why does this realization make her finally enter into the wager he proposes? 6. Lucia states in the beginning of the novel that she is annoyed to be aroused by the figure of Monsieur le Chevalier de Seingalt because she is "the one who arouses desire" [p. 6]. How does this early insight into Lucia’s personality affect the reader’s opinion of her as her story unfolds? Lucia seems to believe that even before her illness she was a "carnal" being, as evidenced by her "satisfaction" with her submission to the Count of Montereale [pp. 99–100]. Does Japin create a sense of inevitability in Lucia’s fate, even before her unfortunate illness? 7. Monsieur de Pompignac taught Lucia that intellectual reasoning and knowledge are paramount. Lucia learned her lessons well. While overcoming smallpox, Lucia concludes: "If my reason could save me from this moment, there was nothing from which it could not deliver me" [p. 93]. However, Zélide tells Lucia, "Reason is but the shell of consciousness, beneath which emotion is far more knowing" [p. 117]. Does Lucia reconcile Zélide’s teachings with those of Monsieur de Pompignac? Is the conflict of reason versus emotion ever reconcilable for her? Which serves Lucia better in her life: reason or emotion? 8. Does the Venice that Lucia visits with Zélide [p. 128] measure up to the image of that city impressed upon her by the Countess of Montereale [pp. 36–38]? Likewise, does the Amsterdam that Lucia inhabits [p. 163] measure up to the image of that city impressed upon her by Monsieur de Pompignac [p. 142]? How does Japin develop his portraits of these two cities through Lucia’s eyes? I do hope that the discussions will pick up. The boards are a lot more fun when there is discussions, but at the same time if there gets to be too much discussion then I wind up spending more time reading about the books than reading. Since there were so many ahead of me on the library's list, I ordered the book from amazon.com for next month. How many plan to read it? I have also reduced my reading time and trying to spend more time on other projects such as quilting and sewing. I also reduced the number of boards I am in to this one board. Thank you for your trouble, Marg. I would think about joining the book depository, but in the meantime I've decided to do other things with my time. I hope I'm not offending anyone of the reading group, but I find the total lack of discussion not inspiring at all. I know I have been spoiled by the vibrant times at the O site, now almost 5 years ago (gasp!) when we started. It's just the way it is, and it's not for me anymore. Sorry, but when I saw the price of this book, I decided to back out. I couldn't get it on my Sony Reader, so as to save on shipping. I had decided not to spend too much extra money this month, since I had enough expenses to pay for March. Also, I want to get Amazon's Kindle, another Reader, so I want to save money for that. Minding my own business, I got a link to a book, on one of my groups, Carnet ...by Craig Thompson. I felt compelled to buy it, so I ordered it from one of the sellers on Amazon, saving around $1.70. For the last few nights, I kept being drawn to a graphic novel that he wrote. I've never read a graphic novel before, although this is mostly a memoir. The name is Blankets. Well, last night, after reading the many positive reviews, I decided to get it or rather I HAD to get this book. I don't know what happened next, but I got knocked off the Internet while scrolling down the page. Then, it took a full 5 minutes, to "copy things." Usually, it takes a few seconds. Then I noticed that my Norton Anti Virus wasn't checked, like it usually is. Don't know why, as I use the laptop everyday. I had to decide whether to order on the laptop without the protection, or go to my desktop, which was still on. Since it was really late, I chanced it on my laptop & ordered it. After, in the glow of buying this book, which turns out to cost more than next months book here, I realized....idiot....now I'm paying shipping on 2 books. I could have gotten free shipping if I just ordered the books together saving around $6.oo. So much for trying to save money. How many will be reading People of the Book? "Margreet, if you are interested in reading this book, try The Book Depository. They have it in stock for 11 pounds 39 pence (no idea what that converts to) and they have free shipping as well, so I don't know how it will work out for you, but for me it is often cheaper to buy a book from them instead of from a bookstore here. Here's the link: The Book Depository"
Second, maybe we need to be more mindful of what's available before we vote. Should we first find out if a book has been out long enough to be in paperback ... AND in some of the used book stores? I'm retired and had to buy In Lucia's Eyes (paperback) and People of the Book (newly published and only in hardback). I hope I enjoy POB, but I have only tonight finally finished ILE, which I'll probably trade at a used book store. I had to make myself read it, and taking so long to complete has made me over a week late getting the final questions posted. I'm sorry, and I promise to get to the questions (including some from me, rather than those vague online ones) as soon as possible. I feel that I have to buy the books, whether I can afford them or not, because all of you depend on me for questions. I would be ever so grateful if some of you would go ahead and post comments as Margreet did recently about ILE in A Great Imperfection. Thanks, Margreet. 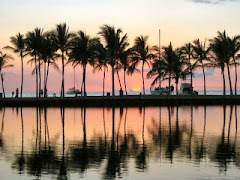 And I should have done this at the beginning of the weekend: It's party time on the island! Lucia and Giacomo (by either of their names) have promised to party with us there, so you will have a chance to ask them questions. I'll mosey on over there with some of the simple food I'm bringing this month, and I hope you'll provide a thing or two as well ... because I declare this party extends 'til the end of February! We have an extra day this month, so enjoy it. I'm sorry to hear you won't be joining us. The book is $25 full price here, but is on line at Barnes and Noble 18.16. Do you have access to ordering from American companies on the web? I'm sorry to have to tell you that I won't be reading Geraldine Brooks' book with you after all. I know I voted for it, but I must have overlooked the actual price before. I just checked my internet bookstore, and the book will cost me €36. That's $46.....yes, that's right: FORTY SIX DOLLARS. As much as I like Brooks' writing, I am going to wait for the paperback..LOL!!! I haven't been posting for awhile. 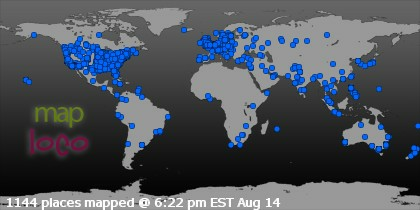 Was sorry to see I missed the party at Escencia. I have the "People of the Book" and started reading it today. I am really enjoying it already. Looking forward to discussing it with everyone. On page 155 it says, "When did I see my Giacomo in that silken Frenchman? In retrospect I can scarcely believe my recognition was not immediate, the very moment he was brought to my box at the theatre. . .In any case, when his wig blew off in the storm by the Amstel, there was no doubt." At first, when he expresses his bitterness about women, she begins to see he has changed-"the bitterness born of his first betrayal, the contempt it had engendered for all other women." Also in his telling her of how he was wronged by a woman in the past, he "revealed that in his heart he accounted as some sort of cheap swindle what was my life's great tragedy." I think she always thought of his love being greater than hers, but as she realizes this is not true, she enters the wager to show that she was indeed worse off because of his love for her. I felt more like Japin didn't want to portray her as a victim, even though she experienced many tragedies in her life. She is a very strong woman to have made the decisions she has made. Okay, I was aware of this conflict between reason and emotion throughout the book, but couldn't quite grasp the final message. The comment from Zelide quoted above for me has a depth that my mind has been too lazy to fathom. In the end Lucia says, "For a long time I too tried to carry the yoke of reason, but it was too heavy for me. I rejected it." It seems that more than one winning over the other, we need both at different times in our lives and for different purposes. Lucia says on page 125, "Compared with my fallen dream (the tarnished image she had of Venice after she knows she will never be with Giacomo), the Venice I found with Zelide was far worse: sludge on the bridges, alleys choked with rubbish...", etc. As she mixes a bit with society, she finds it very much the same as the Countess described--when she goes to the theatre and nobody is even watching the show, they are all so absorbed in making their place in society. It confirms her opinion that Giacamo never would have been successful if she had been by his side. Amsterdam only partially lived up to its reputation of "tolerance". I love this part: "It was some time before I realized a thing assumed among the Dutch: Tolerance is not the equal of acceptance. Indeed, the two are more nearly opposites, the former sometimes serving as subtle means of repression. To accept another is to embrace him unconditionally, now and always. But to tolerate him is to suggest in the same breath that he is rather an inconvenience, like a nagging pain or an unpleasant odor demanding temporary forbearance." I guess he develops the portraits of the two cities by starting out with what she envisions, and then the comparison with reality, and her eventual adjustment to her world. 5. When Seingalt talked about the glass? 6. Both Lucia & G. are afraid of falling in love again. Lucia does what she has to do to survive. 7. Reason. If she followed her heart, she would never let G. go & then there would be no conflict. 8. From what I can remember, Venice was filthy, I think. Anyway, Lucia can only think of G.
It's finally getting interesting. G.'s brother recognizes her. Does he believe her when she denies who she is? I was shocked when he ripped up his drawing of her & threw it into the water. OMG!!!! Don't rip up your arwork!!!!! Geesh! Just let her keep it. I was glad to notice that part 2 of our book was much more entertaining. It was good to discover what actually happened to Lucia, and how she coped. It made me sad that she decided that Giacomo should not see her like this, and that it would be better for his 'career' if she fled, looking the way she looked now. What a society to live in! But.....now that she left her home, it opened the world for her, as a sort of independent young woman, needing a position to make money. her relationship with Zelide sounds a bit weird, I think Zelide was a lesbian. But anyway, with her Lucia traveled across Europe. Instead of 'just' being somebody's wife. Instead of answering the DQ, I prefer to give my own opinion about part 2. 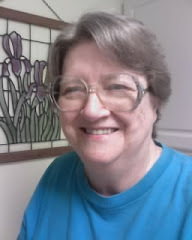 Bonnie of Bonnie's Books makes my day all the time! I know she has already been given this award but I couldn't resist. Bonnie is the best Book Buddies host and a really fun person. She loves to gather us all together to discuss! Thank you Bonnie for the first book club I've joined, I love it! Gigi of What's Gigi Reading? Your turn! Pass it on. What does DQ mean? Q must mean question, but I can't figure out what D stands for. I'm sorry if you already mentioned this before. Inquiring minds want to know. Thanks. Click on the word HELP in the labels just below this post, and you will see all the posts I have ever posted to "help" the Book Buddies understand how blogging works. The most recent posts will come first so, until other "help" posts are written, this post will be at the top of what you get by clicking on HELP. ILE-DQ, which means, here are the discussion questions for the book we are calling ILE, for short. We put ILE-DQ in the labels to say "this post has one or more questions for the whole group to discuss." Usually I'm the one who uses this DQ, to let you know that, when you click on it, you will pull up all posts that have questions to be answered about the book we are reading together. Toby's DQ ~ why the name change? Toby asked, "Why did Giacomo change his name to Seingalt?" Since I (Bonnie) don't know, I'm hoping the answer comes up in the next section of the book. When it does, somebuddy jump in here and give us the answer. Inquiring minds want to know. 1) Lucia grows up in an upper class family,the masters, even though her parents are considered lower class, the sevants. Lucia gets a private tutor to educate her. She also has the freedom to mingle with upper class men & encouraged to fall in love with an upper class man. The old lady's doing. That old man creeps me out. He tells Lucia, who's about 15 years old. You are ripe now. I can smell it. He describes the smell & greedily smells the air. Ich!!!!!!! Run Lucia, Run!!!!! 3) Who knows what Lucia thinks of men! She thinks so much, but she is basically just being honest about her feelings. Maybe she thinks that men like to chase women & then dump them when they catch them. I found the names too long to remember, & have to ask myself, which guy are they talking about now. It would be easier if they said Bob, Mike or Harry. LOL! ILE-DQ ~ When did she know? One thing I thought about as coming to the end of reading this part was when did Lucia know that Seingalt was Giacomo? When she first saw him walking from her boat? At the theater? That night at the house before the storm? Or didn't she know until he told the story of the girl he first loved to her? Now that's a good DQ! I think she recognized him right away, but she doesn't want to reveal herself, so she keeps quiet, wondering when Giacomo will realize it's her. But I think he doesn't remember her at all, she was just a child to have fun with, and she has gone from his memory long ago. And to think she sacrificed herself for his sake (well, that's what I think after reading part 1). We'll see how it goes. What an immense relief to read your comments, Bonnie, Neco and Shirley. I finished part one last week, and put the book aside to keep to our schedule for a change...And to be honest that wasn't a big sacrifice. I seem to be not so very interested in Lucia and Giacomo. Esp. Giacomo, I find him a narcissist jerk (which he probably was!). To slowly unravel Lucia's story, as told by Japin, is sort of fascinating though. I couldn't do anything with the discussion questions, I was wondering if they were about the book I am reading,,hahahahahaha. Lucia's childhood sounds like a happy one, living on a big estate, favoured by the landowner/lady. To crawl into bed with Giacomo with her parents' permission sounded very weird. She ended up as a courtisane, or prostitute. After only having read part one as yet, I don't know why this happened. I had to laugh when you, Bonnie, wrote that you fell asleep even the first time around. Maybe when we have finished the book we will realize what a great work of literature this is, but now I don't really see it. I find the buildup of the story too 'artistic', if you know what I mean. Sorry folks! Whew! I'm glad that I wasn't alone in not having any insight on the posted questions. I read the book and enjoyed the tale, but unfortunately remember less than I'd like of the details. It was due back to the library otherwise I would have tried to have kept more to the schedule. Okay, I have finally finished reading Part 1. Now, sigh, I look at the questions in light of what I've read ... and I don't have answers. I felt less alone in my confusion and more confident in rereading and posting up some sort of answer. Okay, going to go reread bits of part one now. Okay, I have finally finished reading Part 1. (You ask how I could post questions when I hadn't even read the assigned section? Easy. I found questions online and posted only those that referred to pages within Part 1.) Now, sigh, I look at the questions in light of what I've read ... and I don't have answers. How do Lucia’s early relationships shape the person she becomes? What does the Countess of Montereale give Lucia that her own mother cannot? I don't know ... maybe schooling Lucia to become the wife of a diplomat? Lucia says of men, "Most aim to please with little understanding of our pleasure. ... More than anything, men want that which has been withheld. A happy certainty is no match for a mystery denied. Given a choice, a man will always take the unknown" (pp. 8–10). What is Lucia’s opinion about men? I definitely get the feeling she doesn't think highly of most (maybe any) of them: "There is nothing a man can say to a woman that I haven't heard before" (p. 8), she thinks. And on the same page: "Some women live for sweet talk. I would rather go without. But how is a man to know that? Most aim to please with little understanding of our pleasure." It was to Seingalt himself that she said, "Give it up, sir ... You have met your match" (p. 10).